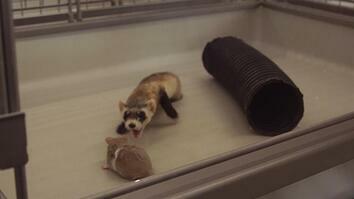 May 8, 2015 - After acclimating to burrow systems and learning to hunt, captive-raised black-footed ferrets are finally prepared to live in the wild. 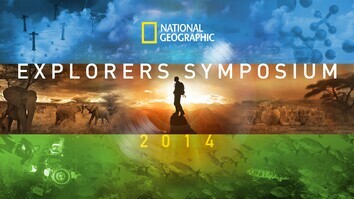 Conservationists from the U.S. Fish and Wildlife Service work with private landowners to allow these endangered carnivores to roam the prairies of Colorado, where they hope to ensure the recovery of the species as well as protect the grassland ecosystem. 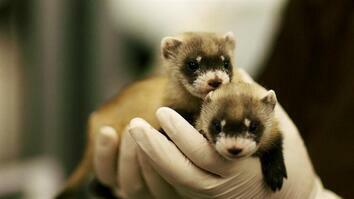 Click here to learn about efforts to save the black-footed ferret. You spend all this time inside raising ferrets and cleaning up poop and all the other things. It’s really rewarding to come out on the prairie on an evening like this and see the animals in their natural habitat. So these ferrets have all just finished their pre-conditioning period. It’s about 30-days out in the pens. They learned to live in burrows, eat prairie dogs, become accustomed to the weather patterns and sounds and sights of living on the prairie. They all passed so now they are all ready to be released. Historically they really didn’t know how many black-footed ferrets were in the wild [in] the turn of the century. About 98% of the Great Plains had been plowed up by that point so habitat was lost. Then in 1979 they were actually declared extinct. And then in 1981 it was re-discovered in Meeteetse, Wyoming. So a captive breeding program was started in about 1985 to bring back the species from extinction. It’s a great program we bring in state agencies and tribes to help us re-introduce the ferret once we raised them in captivity. All the animals that are destined for release or even kept in the breeding program need to pass medical evaluations. They have to have both canines intact, they have to, you know, eyes in good condition. They need to be at a healthy weight. At a gross level they need to be in good enough condition that, given the environmental challenges that they are going to face, they stand good chance of survival. All of the ferrets that are released into the wild are vaccinated for distemper, and they’re vaccinated for rabies and they’re vaccinated for plague. One of things other than human encroachment and agriculture that reduced their population so significantly was probably canine distemper and also bubonic plague or what they call Sylvatic plague. Since they are so uniquely sensitive to canine distemper, we worry that if we send them out un-vaccinated that we’ll lose them before they have the chance to reproduce. Well the city of Fort Collins own two large parcels. We bought the parcels for a variety of reasons but it included three to four thousand acres of prairie dogs that occur here. And as part our management efforts we always wanted to bring ferrets back to this landscape. This is truly a voluntary incentive-based opportunity whereby landowners are paid for the habitat that they are allowing us to use for the recovery of these mammals. The landowners do understand this ecosystem. That what they make their living off of. All we have to do is explain that they only piece that is missing out of this wonderful ecosystem that they have is one of the top level carnivores. And that is what we are releasing here today. We have a good home for ferrets to go. We were at zero ferrets and now this landscape has 42 ferrets on it, which is the first time a long time that’s occurred. Well we’re lucky to have this unique species and we almost didn’t have them. So if we can do anything to hedge our bets and keep them alive out in the wild and let them prosper, I think that is worth doing.